How many Muslims who kill in the name of Allah have to profess their loyalty to the teachings of Islam in open court before judges and attorneys realize Islam mandates violence according to sharia (Islamic Law)? 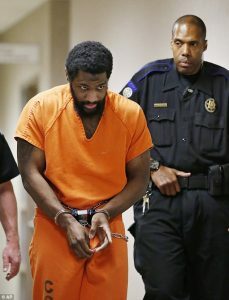 On September 24, 2014, Alton Nolen, a Muslim, sliced the neck of Colleen Hufford – a former co-worker at Vaughan Foods in Moore, Oklahoma – and then proceeded to saw her head off. As the case has moved through the system, defense attorneys, prosecutors, and the judge in the case seem to have no clue about what Islam teaches and why it is pertinent to the case. Nolen, whose appearance prior to his killing of Colleen Hufford was increasingly visibly sharia compliant, stated he follows the teaching of Islam – ie the Sharia. Yet Cleveland County District Judge Lori Walkley and even Nolen’s defense attorney are concerned he is not mentally fit to make this decision. Why? As we have heard time and again after Muslims obey the sharia and kill non-Muslims or Muslims who do not adhere to sharia, no “religion” would teach violence against others. But Islam does. Right. Because jihadis only care about sharia. On October 5, 2010 at the sentencing hearing, Shahzad was even clearer about his motives and beliefs, yet the trial judge, the Honorable Miriam Goldman Cedarbaum, corrected him on his beliefs. At the elementary school level and at the highest institutions of Islamic jurisprudence Islam teaches jihad is a permanent obligation until the entire world is under Islamic rule – sharia – and jihad is the vehicle to do it. Where is the “other” version of Islam taught? It is not. Acts of jihad we witness around the world and in the United States each week are not done because Muslim have mental disorders, do not have jobs, need more money or Pepsi cola, or because of American foreign policy. They do it because it is a permanent command from Allah to do so. Those participating in the American legal system, specifically judges and attorneys, have a legal and professional duty to understand what Islam is as it relates to the flood of cases across our nation, and must do so if we are to have any chance of stemming the enemy in the legal arena. Judicial trepidation … Islamic terrorism’s intended effect. The defense attorneys, prosecutors and judge in the 2014 Oklahoma beheading case should have been disbarred, impeached and paraded across every TV screen in the country in order for the American public to see what a gaggle of cowering quisling liars looked like. They knew perfectly well about the lethal violence being encouraged against Americans & Israelis in their state’s mosques, and in most other parts of the world. And were also aware that neither sharia law nor the Koran are worth the paper they’re written on with respect to homicide, or indeed with respect to anything else that pertains to this country’s criminal laws. With respect to the New York case: Inasmuch as Federal Judge Miriam Goldman Cedarbaum (1929-2016) — who in October of 2010 after the “Times Square Bomber” pled guilty, sentenced him to life in prison without parole — had a close familial relationship with the leader of “Reconstructionist Judaism” (based in Chicago) whose practitioners for the most part dismiss “the idea that God reveals his will to human beings”, as supernaturalism (i.e. ostensibly believe in ghosts etc.) her line of questioning may have simply reflected, therefore, a mental comparison she was concentrating on at the moment she corrected Shahzad about his religion. Keep up the great work John. I’ve read your book and was impressed by your priceless knowledge on Islam. I have been sharing your truths with family and friends. Here in Australia, political correctness and our leftist elite media work 24/7 to spread disinformation and lies when it comes to Islam. I can’t grasp how dumb and stupid our leaders are on the issue of Islam, they refuse to take it seriously. Our current Prime Minister Malcolm Turnbull is so fixated on his own personal wealth (he is a multi–milloinaire) that he is to busy following an economic agenda rather then a national security defence plan of attack against Islam. Good article because as stated nothing is unclear about the statements of Shahzad, he is a muslim following sharia law and the obligation to those who choose to do jihad. The courts, judges and attorneys( media, politicians, educators) have an obligation to know what statements are from sharia law and the links to Islam and his statements should not be misunderstood. This terror act is linked by doctrine to terrorists and the doctrine should be seen as a tentacle of the enemy methods. It is not peaceful, but for purposes of misdirection to spread, they will act with a calm face untill the time they choose to act…this cannot be vetted and the followers should not at all be allowed to purchase property for mosques and legal jurists to hide the mission as appearing peaceful and doing outreach of deception. However often this current administration is using flowery language to seduce it’s acceptance while knowing full well the doctrine it is subversion in my mind and opinion. The work of this site and others and access to millions is growing and it shows in this election….that people now know and hopefully will understand the issue and that the process of refugee resettlement should be ended due to national security… the doctrine is inherently destructive no matter the degree. Thank God for “Understanding the Threat” and John Guandolo. These examples need to be “shouted from the rooftops” in America. Islam is NOT A RELIGION OF PEACE!!!! I am so glad to have found your website John, thankyou thankyou, i don’t feel so all alone anymore. John Guano lo is as right as rain. His books are tremendous eye openers. Along with John, please read Serge Trifkovic’s , Defeating Jihad, and The Sword of the Prophet. Armed with this knowledge, as a nation we might make it. GOD BLESS AMERICA.